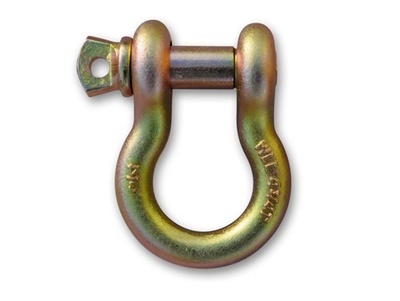 These heavy duty 3/4" Recovery Shackles are rated at a working load limit of 4-3/4 tons. Made of high quality steel and yellow zinc plated for corrosion resistance. The heavy duty D-ring and massive 7/8" threaded pin make a quick job of safely rigging recovery straps and winch cables. No 4X4 should be on the trail without a couple of these in the onboard recovery kit. Sold by the piece.